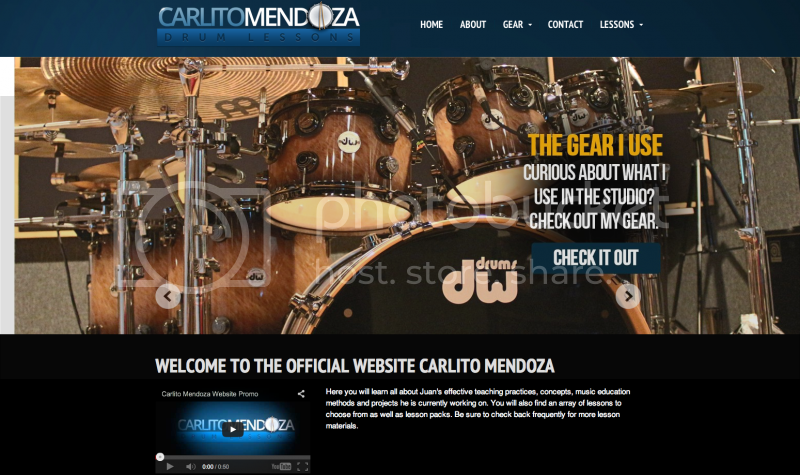 The launch of Carlito Mendoza Drum Lessons is finally here! First, I would like to thank everyone for all of their patience during this process. It took a lot more work and coding than I anticipated, but it was definitely worth all of the revisions that took place. On the site, you will see many different types of lessons (PDF files included), lesson packs, concepts, approaches, masterclasses, optional private Skype lessons,and bookings. You will also notice that there is NOT a subscription fee. During these hard economic times, I know it is difficult to commit to a subscription, so the whole site is on a "pay as you go," basis through PayPal. In addition, the site will be updated on a regular basis as the drum lessons library expands. Finally, I will send out a monthly newsletter, to keep everyone posted on what new lessons, merchandise, masterclasses, etc. are on the website. If you want to sign up for the newsletter the link is https://www.facebook.com/juancarlitomendoza/app_100265896690345 . Have an awesome and prosperous NEW YEAR! Until next time! Let's get to work!